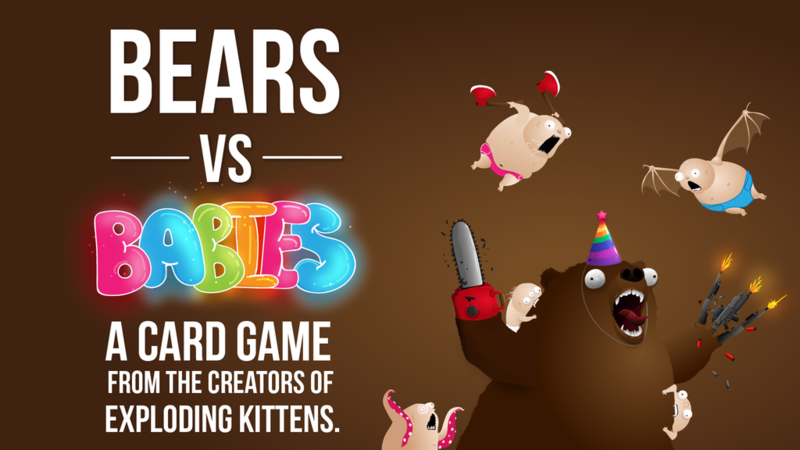 The group behind Exploding Kittens has once more headed to Kickstarter. This time around it's all about Bears and Babies. Can you create a monster strong enough to defeat an army of horrifying babies? That's your task in Bears vs. Babies. The game is rather simple. Players draw cards from a collective deck. On your turn, you play a card to either grow your monster or add to the army of babies. You can also provoke the babies to attack. If your monster is strong enough (I.E. - it has more cards on it than the number of babies), then you eat the babies and score those points. Otherwise, your monster gets defeated and you've got to start over. Of course, your opponents are also going to be trying to hack apart your monster and steal its parts. As is expected, the game blew past its funding goal almost immediately. So there's no worry there. They're currently working on stretch goals much like they had in the Exploding Kittens Kickstarter. The campaign's set to go for another 29 days.